Manure consists of feces whether or not mixed with straw. It is a soil improver that like compost (the decayed remains of plants) contains minerals and nutrients. Liquid manure is called slurry, or liquid fertilizer. Horse manure is used for growing mushrooms and making a hotbox. Justus von Liebig showed around 1850 that plants did not absorb organic matter, but inorganic salts. Organic material must first be digested suitable. Cattle manure with straw can digest best one to 12 months. Even better is if you can convert (turn inside out) it 1 to 3 times. Bovine manure of young animals often contain anthelmintics that also are deadly to your earthworms and soil life. Straw contains a lot of carbon, slurry lots of nitrogen. They complement each other well. A deep litter thereby also contains fine manure. The losses of nutrients are in fact the least if you link nitrogen-rich fertilizer to carbon -rich material (straw). In the digestion of fresh manure the content of carbon lowers and the relative content of nitrogen increases. This increases the fertilizer value. This process normally takes more than a year. 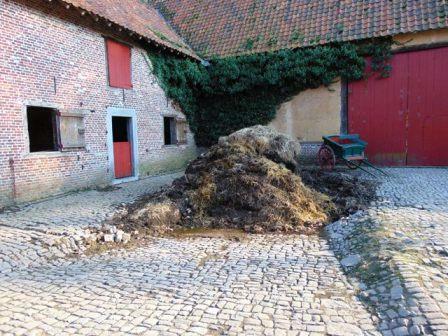 Old manure is thus richer in nitrogen and better to use. The flush toilet breaks the natural cycle in the food supply. Crops extract potassium, nitrogen and phosphorus to the soil. The toilet flushes soil improvers away instead of returning them to the soil. As a result we need, synthetic fertilizer, expensive drainage and sanitation infrastructure, and a lot of water wastage. Chemical fertilizer and energy costs freshwater, rivers and water are polluted. In some periods and places feces were collected carefully and traded like China, Japan, also in our Low Countries since the 17th century. When F. H. King visited in 1909, East Asia (Japan, Korea, China) he saw everywhere, including during his journey from Yokohama to Tokyo, transport of faeces. When he asked the interpreter whether they were discharged into the sea in winter, because it is much cheaper and faster, he replied indignantly:” What a waste that would be!” In the districts three residents could get a room for the price of one tenant, and they stayed even free with five, if they put their droppings daily to the landlords disposal. This ”night soil” was combined with wood ash and silt from rivers and canals, collected and returned to the country. At several places in condominiums and (eco)cities there are vacuum toilets and - sewers working. The stool is collected by vacuum. This provides also good economic results. Per million population in Europe and the U.S. annually 5,000 tonnes of nitrogen, 2,000 tonnes potassium and 1,500 tonnes of phosphate is washed away. In Belgium and the Netherlands together is that for every year at least 135,000 tonnes of nitrogen, 54,000 tonnes potassium and 40,500 tonnes of phosphate. That represents more than 40 million Euros (1.5 Euros / person / day). Probably embarrassment and taboo in this regard need to be broken in order to recover it by composting back into the food chain again. The beneficial effect of fertilizer on plant growth is remarkable. In every meadow you see at the height of the grass silhouetted clearly where there is mud. Our ancestors knew this since they are farming. They understood that the substances that plants and fruits picked from the ground ran out and had to be supplemented in order to get a proper harvest. The manure was - to keep cattle - often a more important factor than the milk. Manure was the determining factor for the growth and size of a (family) company. Not fertilized land will eventually become impoverished and acidic by leaching and acid rain. First, one used deep litter for the production of fertilizer. Manure was covered herein 1 or 2 times per day with dry organic material. Straw, turf, peat, everything was suitable to produce manure. The treading cattle mixed and pressed everything together. The barn was mostly emptied once a year. Cows stables were later devised so that the animals were directed, all the butts over a trench, to catch as much manure as possible, the feces to be mixed with straw (or sod, peat...), to absorb slurry in gutters and basements. They were often more inside, then held out, just not to loose fertilizer. In other cases, the animals were at least for the night at the lairage. In sheep that happened also with movable pens or cages (also called night bounds or bends), which after a while then were advanced again with their own length. In order to make the lean sandy soils around Hechtel (Belgium)a little fertile, before the use of industrially produced fertilizer municipal fertilizer (waste of all kinds) was supplied with train wagons from Antwerp and Hasselt. An economical solution for both parties. (Above potting shed) In order to harvest more, manure was needed. In principle, the endless heath was large enough to graze many more sheep (and to a lesser extent cows). The limiting factor was the lack of pasture in the stream valleys, the only places where hay could be collected for the winter. The limited amount of hay and winter feed thus determined how many animals could be kept for the manure and in life.
. A sheep eats about 1 kg per hour. The stomach can contain up to 8 kg of food. The digestion begins only after the ruminating. So you can walk about 7 hours with sheep to graze, before they start to digest. They do this only when they rest, and stay on site. So not as long as they keep moving. Under this condition, sheep are therefore ideal for impoverishment of land, and to collect tons of manure per herd by excreting them at a collection point in the evening. The discovery of this mechanism made our agriculture possible, because after the removal of field yields it was necessary to supply fertile substances, minerals, etc. again. This knowledge has given Western Europe an enormous advantage in terms of agriculture. In addition, sheep also ensure the distribution of seeds (through the ground between their hooves and seeds in their wool). Many lease letters from 1300 (to 1800) include the obligation to apply rotation, and to fertilize the land. Sometimes tithes were paid to bring manure to the land of the landlord. Food cultivation without fertilizing the land again is an exhaustive form of plunder with annually significantly lower crop yields. Vacant land was grazed and plowed (broken) to control the weeds but not cultivated. After 1400 was collected in many places even city slurry (complete inland barges and carts full of wooden barrels!) and city manure (wood and peat ash waste (there was no plastic, tin, glass...), toilet emptied...), and manure from dovecotes. The right to sweep streets was therefore even leased. Cities, sweeper and farmers did a good thing to. Most of the gin distilleries were producing fattened oxen on their waste. That generated a lot of manure. Of course, people also gave their own contribution with night buckets and a (possibly or not mobile) outhouse. To break the cycle of some parasites, it is recommended to compost also human manure a year and / or to use it preferably at fruit trees instead of in the garden or in the field. Given urine contains lots of valuable fertilizers it may seem worthwhile to go pee in the garden. Then you consume no rinsing. Human urine is a excellent source of nitrogen, phosphorus, potassium (N: P: K > 18: 2: 5) and trace elements, and moreover in a form which easily penetrates into the soil. Available all year round and for free. Urine is 95% water and 2-2½% urea. Urine urea is going to smell after it is exposed to air. This will create ammonia. Urea is a nitrogen-containing fertilizer: (NH2) 2CO. Once ammonia formed it is unfit to pour directly at the plants. Urea is the most important component in modern commercial fertilizers. It is quickly converted into ammonia and nitrogen. The NPK value of urine is 11-1-2.5 (varies, of course) plus some other substances. Urine is therefore useful in the garden, but you must dilute it greatly. Fresh and pure, the nitrogen causes yellow (fire) stains in e.g. your lawn. The introduction of artificial fertilizer has changed livestock and farming dramatically. The term ’emaciated’ comes from agriculture, and means exhausted. The Old Belgians already knew the effect of lime: they scattered marl over the heavy clay soils to make them less acidic. Also marling was seen as a form of fertilizing and recorded in lease letters. (Also dredging of ponds was accepted as a kind of marl.) The system exchanged every 3 years: fattening, summer crops, winter crops, fallow. Land is being depleted by agriculture. That is why, centuries ago, villages were moved around every 2 generations (if the soil became too acidic and too poor) to be rebuilt 1 to 2 km further. Only after 'inventing' the 'marling' there was a cure for acidic soil, and villages remained at a fixed location.